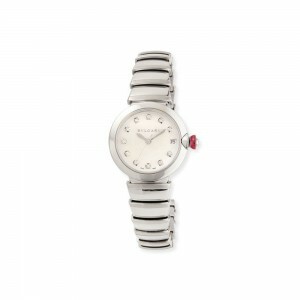 33mm (1.3") stainless steel case with exhibition case back. Stainless steel bracelet strap with deployant clasp. 0.2161 total diamond carat weight. 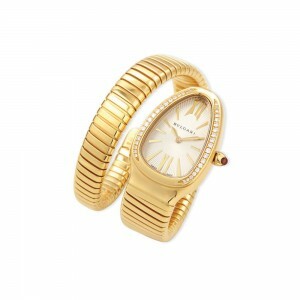 BVLGARI watch from the Serpenti Tubogas Collection. 35mm case with white diamonds on bezel. Bracelet strap coils around the wrist. White dial with Roman numerals and stick markers. 0.293 total diamond carat weight. 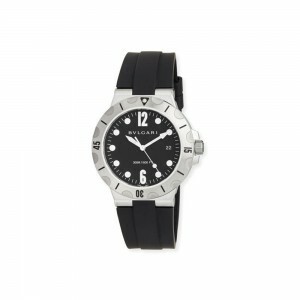 BVLGARI watch from the Diagono SCUBA Collection. 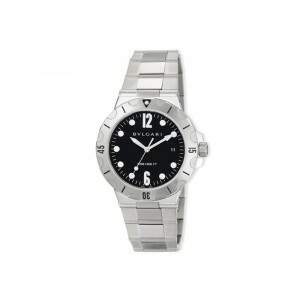 41mm (1.6") stainless steel case. Black dial with luminous Arabic and dot markers. Date window display; three-hand movement. 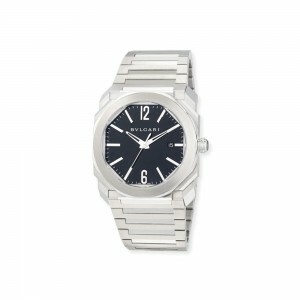 BVLGARI watch from the Octo Solotempo Collection. 41mm octagonal stainless steel case.